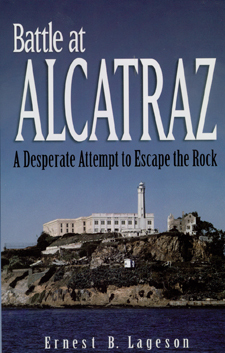 In May of 1946, six desperate inmates attempted the impossible—escape from Alcatraz. The result: one of the bloodiest uprisings in the history of American prisons. For months, the “cons” had meticulously planned the breakout, and at first, the plan went like clock work—they broke into the gun gallery, armed themselves, and took nine guards hostage. But when their plan hit a last-minute snag, the heavily armed inmates refused to surrender, swearing they’d fight to the end. The battle ensued as U.S. Marines shelled the cell house, and five Coast Guard ships and a Navy destroyer circled the island. Thousands of rounds were exchanged during the three day siege. When the inmates realized their escape was doomed, they shot the hostages to eliminate witnesses. Ernest Lageson Sr. was one of the guards shot. His son, Ernest Jr., a teenager at the time, agonized along with other hostage families, waiting to hear if loved ones were alive. Now, Ernest Lageson Jr. delivers an insider’s account of both the notorious riot and life inside the most infamous prison in American history.